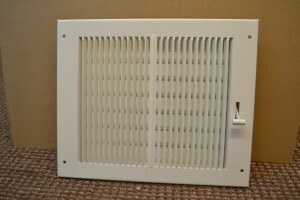 Type 44R series provides a full range of sizes to compliment the type 33G Return Air Grille. Control consists of a lever operated parallel set of blades to permit adjustment of the air flow. 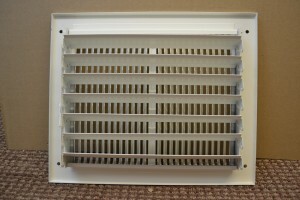 Standard design consists of vertical louvres with left and right hand deflection from centre with 30 Degree deflection. Also available to special order are registers with a left hand deflection or right hand deflection as well as reverse sizes. A polyester powder white finish is standard although a satin silver finish is also available to order and all units are supplied complete with zinc plated self tapping fixing screws and foam sealing gaskets to ensure an air tight seal around the flanges. Left or right hand deflection available but a setting up charge is applicable for each size.